Bluets – loudlatinlaughing – Euge! Euge! 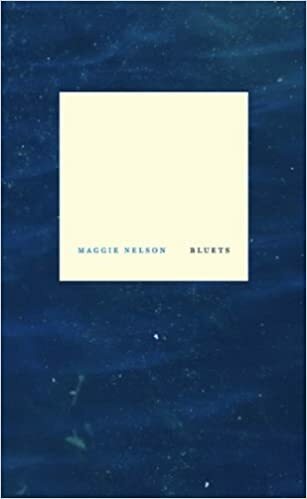 Maggie Nelson normally charms me, so I was surprised to find myself yawning through this book, mostly a function of mood, as I was headed out the door to gift it to a friend. For some reason I thought I’d read it before, and when I bought a copy of it, I’d intended it for my forever shelves. In her usual way, she meanders around Gertrude Stein and Sei Shonagon’s Pillow Book and Goethe’s theory of color and various and sundry Greek philosophers and Joseph Cornell, Monet, Mallarme. What I like best is the meditation on a central theme that anchors the book but allows wide sway. Is it poetry, is it digestible mainly because of its tiny fragments that our attention-addled brains can grasp onto?